Happy February everyone! I have some exciting news to share! I am a new official Brand Ambassador for Rodelle! You don’t even know how excited I am to be partnering with them! Their products are absolutely amazing and I have been using them for sometime now and I have to say the quality of everything they produce is top notch! They have a variety of different products focusing mainly on vanillas. Some of my favorite ones I’ve tried this far are their vanilla beans, vanilla paste, almond extract, cocoa powder and their brisket rub!! That’s right, they have some savory ingredients as well that are absolutely addicting! You can learn more about them and these great products by visiting there site here! Speaking of ingredients, how about we do a fun little giveaway for a little Rodelle Kitchen starter pack? The starter pack includes 8 oz Gourmet Baking Cocoa, 4 oz Vanilla Extract, Vanilla paste or Vanilla Beans and a 2 oz Extract of your choice either Pumpkin Spice, Chocolate, Lemon or Almond! I know you guys will enjoy these ingredients as much as I do! Just enter the Rafflecopter giveaway below for your chance to win! 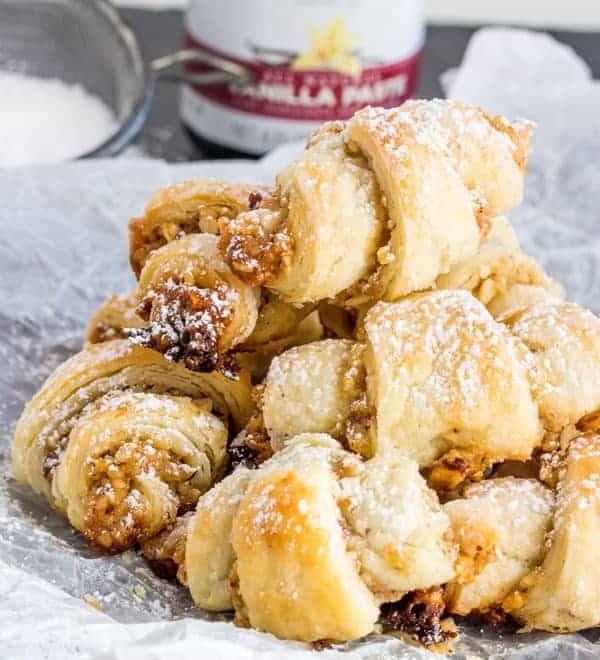 Now how about we move on to this fun Rugelach recipe I have. 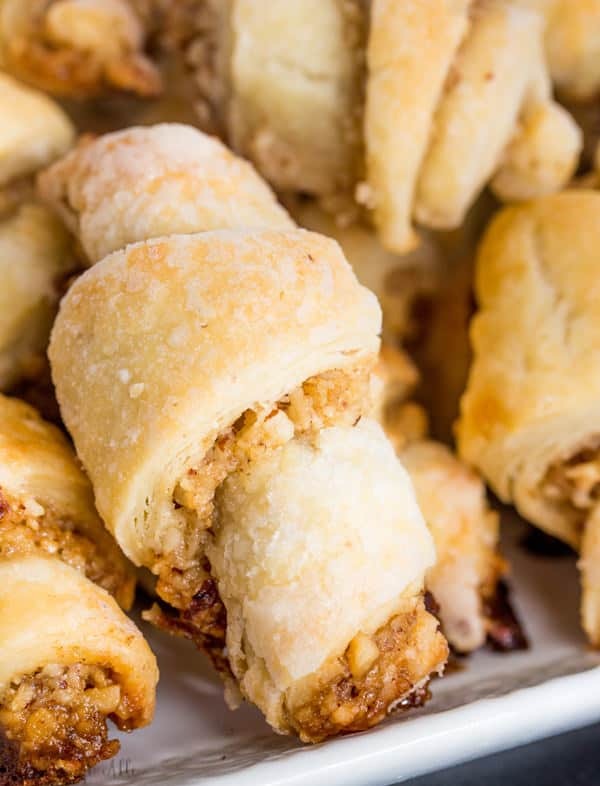 If you’ve never tried Rugelach before, you’re missing out! These little cookies and bites of heaven I tell you! A sweet and nutty explosion in your mouth! 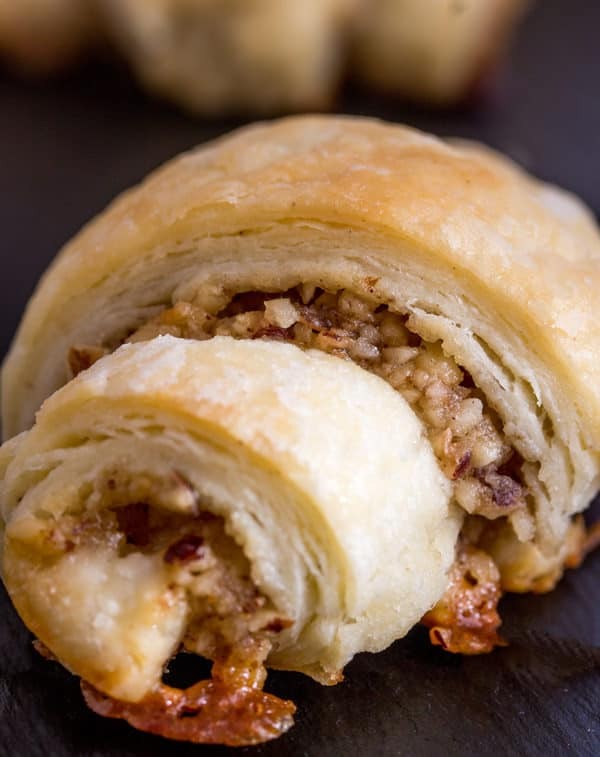 They are a pastry dough filled with a mixture of walnuts, honey, sugar, butter and vanilla! For my recipe I used Rodelle Vanilla Paste! The Vanilla Paste is a blend of concentrated vanilla extract and vanilla beans. It’s not so much a paste as it is a more molasses texture. It has pretty little specks of vanilla bean in it and omg smells amazing! No fret if you don’t have vanilla paste you can easily substitue the same amount of vanilla extract or vanilla beans. So like I always say, we keep things easy around this house. The hardest part to these bad boys are the waiting for the dough to chill. I think that’s kind of always the hardest part when I reference the “hard part” of my recipes. The waiting game I tell you!! So this batch of Rugelach makes about 64ish cookies. You can absolutely decrease the recipe but the cookies are smaller so I don’t see why you’d want to anyways! You know what I mean?! The more cookies, the more sweets, the more sweets the better you feel…most of the time. These are perfect with your morning coffee or with a nightcap! 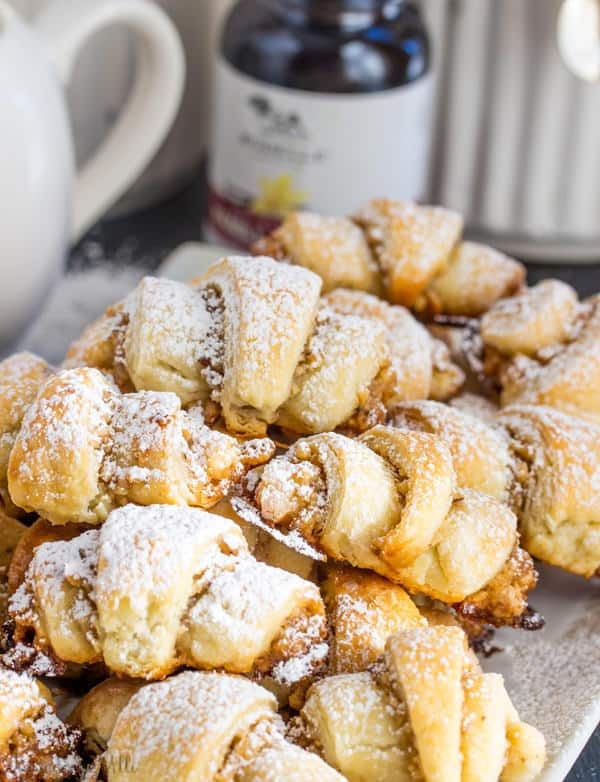 They puff up nice and golden and that extra sprinkle of powdered sugar on top gives it this nice sugary burst after each little bite! 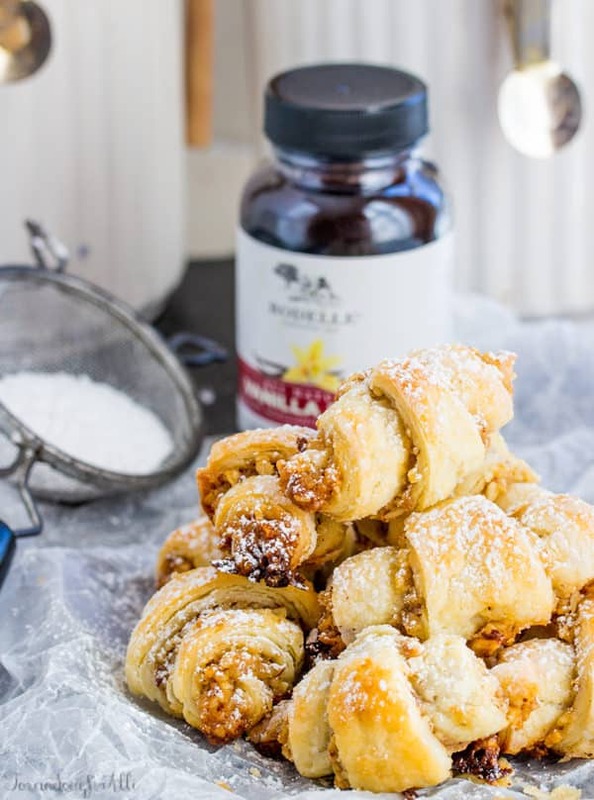 So if you’re looking to switch up your cookie routine and seeking something a little different then I highly recommend Rugelach! They are family friendly and fun for everyone to make. To make your dough in food processor pulse together your flour and salt. Add in your cream cheese and butter until crumbs form. Mix in your vanilla paste and egg yolk and blend until dough comes together. Remove from food processor and gather into ball and then separate into 4 sections and flatten into discs, cover with plastic wrap and refrigerate for at least 2 hours. Meanwhile to make your filling, in food processor blend together your walnuts and hazelnuts until they are broken down into crumbs. Add crumbs to bowl and mix in your butter, honey, sugar and vanilla paste, set aside. Once dough is chilled remove from refrigerator and spread powdered sugar on flat surface and on top of 1 disc and roll into a 1/8" thick circle. Spread 1/4th of your filling mixture thinly across dough and cut into 16 (or less for larger) wedges like a pizza. Starting from edge roll up into center, repeat with remaining. Place on parchment paper lined baking sheet and refrigerate for about 20 minutes, repeat with remaining dough and filling. Meanwhile preheat your oven to 375 and bake in batches for about 20-25 minutes or until golden. Remove from oven and let cool slightly before removing to cool on cooling rack. 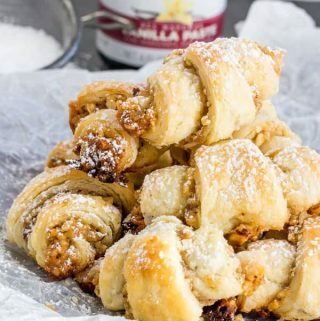 Once entirely cool sprinkle with powdered sugar and enjoy! THESE WERE REALLY NUMMY LITTLE BITES. NOT TOO SWEET OR FILLING. WILL MAKE THESE OFTEN! How fun! I love good vanilla and vanilla bean paste! I’ve only tried the vanilla extract but I’ve noticed the difference between it and what I had been using before. I love it! There is a very distinct difference in store brand and Rodelle extract. I would like to try the vanilla paste and beans….but I love the vanilla extract. My favorite product is the vanilla extract because I use it so much! I’ll definitely be trying your recipe. It looks so yummy! This recipe looks so good! I haven’t tried Rodelle yet but the beans or extract sounds awesome! The only Rodelle product I’ve tried is the Pure Vanilla Extract and it’s fantastic. 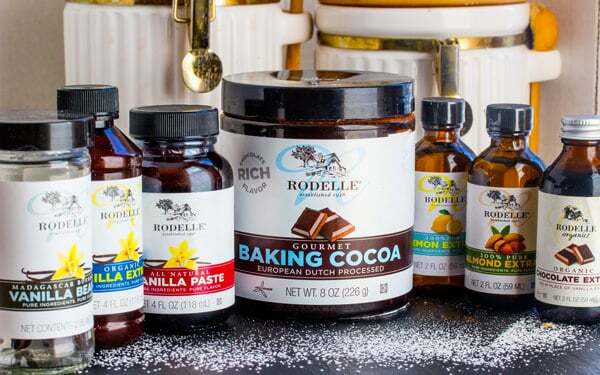 I’ve never used Rodelle – but I bet I would love the vanilla extract! i have not tried any of their products yet but i sure want to!